Our company has advocated loudly and consistently for the Digital Principles for development and also the inclusive processes that helped to bring them about. We’ve worked according to these principles and taught people to leverage them in their own fundraising and work. That’s why it was particularly disappointing to see this month’s launch of a new set of Principles on Identification for Sustainable Development. These new principles are supposed to guide major donors and INGOs in their development of technologies that help to secure the identity of people around the world—an identity easily combined with financial, health and other metrics. Our company was one of the first five signatories of the Digital Principles and we communicated actively in the previously open forums about them; we also develop open source platforms near the intersection of these issues. Even so, nobody on my team was invited to this process or even knew that these new principles were being developed. In speaking with my colleagues who played a leadership role in spearheading the Digital Principles, I've already heard from others who were left out of the loop. 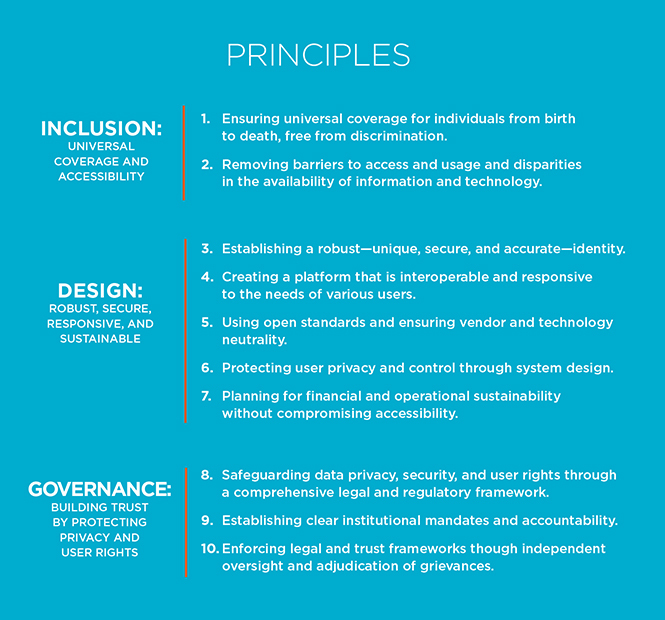 In contrast to the Digital Principles, these ID Principles were decreed straight out of the gate, built upon “upon existing international norms.” While the announcement says "we recognize that they will need to evolve over time to incorporate a broader range of stakeholder perspectives;" that doesn't feel genuine in the least. How is good dialogue to be fostered when the heavyweights have already let the ink dry on their own expectations? We miss the opportunity to discover and create emergent principles informed by stakeholders and key perspectives from the community of practice. This style of release also seems to confirm fears voiced by the Digital Principles community when their open forums were effectively privatized by the optimistically named, Digital Impact Alliance. That body already has a marked tendency to host in-person events in the DC area while making little effort to include those from other time zones or language groups. Even if you wave aside these red flags, there’s still the glaring and highly problematic omission of a principle committing signatories to developing open source tools. The corresponding principle in the Digital Principles has been a thorn in the side of various private sector actors from the moment the Digital Principles were launched. Folks have sought to portray open source as unsustainable and sought to excuse themselves from the challenge of true capacity building—a line of attack to which we have responded in the past. Failing to commit ourselves to building open source tools will only facilitate a wave of digital colonization. That is not an overstatement. If companies and organizations from wealthy countries retain ownership and control of digital infrastructure that they build for comprehensive identity tracking, we are just permitting a new generation of power-aggregators to build the railways and harbors that extract the 21st century’s favorite raw material: personal data. Building open source is the best and most important safeguard against these types of power dynamics and power grabs. The ID4D principles also seem unaware of key transformational trends in technology. The drive towards decentralization embodied by experiments in the blockchain arena is not a fad and its widespread commitment to open source code is not a coincidence either. Letting practitioners stay within their centralized comfort zone for another bunch of funding cycles prevents the aid community from keeping pace with innovations that are already disrupting and shaping our world. Experiments in ownership design like platform cooperatives also hold huge promise for development work and truly sustainable handovers of digital infrastructure. The ID4D principles, as currently worded, will effectively chill innovation in these arenas by handing the advantage back to status quo actors with an unimaginative (and conveniently profitable) approach to sustainability. People are waking up to the fact that data is money and we don’t need rent collectors in 21st century development. It is, at the most basic level, a principled stand that public money should fund public goods. Before closing, I’d like to acknowledge the validity of the concept of creating principles around ID for sustainable development and the quality of principles 8 and 10. But we need to aim higher than these new principles. They are neither in content nor in the process by which they came about deserving of endorsement.